Juniper Beach was established as a Provincial Park in 1989. The park protects a representative desert landscape which contains sagebrush, prickly pear cactus and of course, juniper. Part of the landscape includes deep post-glacial deposits and large scale erosion features. It is a convenient overnight camping spot for travelers on Hwy #1 and provides access to the Thompson River. Both CNR and CPR railway tracks run by the park and provide an attraction to train-buffs. This park is also a popular base camp for visitors enjoying boating, fishing, photography and touring historic Hat Creek Ranch and Ashcroft Manor, both nearby. In the areas surrounding the camping sites you will find prickly pear cactus. The spines of this low-set plant are sharp and strong. Wear sturdy footwear and be careful where you step if you are hiking or walking in the area. Be very careful with your pets. Entering the park requires crossing a train track. This is a controlled train crossing, use caution and obey all signs. Valuables should be stored out of sight and locked up at all times, especially when left unattended or at night. Please report any thefts to the park staff as soon as possible. Traffic Safety: The speed limit within the park is 20 km/hour or less. Motorcycles and bicycles are permitted on park roads only. Motorcycles must be properly licenced and must be operated by a licenced driver only. Helmets must be worn. Unlicenced ATVs or dirt bikes are not permitted. Parking is prohibited on the side of the road. Please park on the gravelled portion of your campsite or in designated parking spaces. Vehicles parked in day-use areas after 11 pm may be ticketed or towed. Pets must be on leash (no longer than 2 metres) at all times while in the park. They are not allowed on beaches or in day use areas. Owners must clean up after their pets. Consumption of alcohol is prohibited except in your campsite. On the north shore of the Thompson River, 19 km east of Cache Creek on Hwy #1. The closest communities, towns and cities are Cache Creek and Savona. Conservation: Undisturbed low elevation grasslands with their associated sagebrush and cactus are rare in British Columbia, and Juniper Beach Park protects one of the few examples found in the BC Parks system. Wildlife: Fish species in the Thompson River include trout, steelhead, and salmon. The dry sagebrush areas of the park are home to Western Rattlesnakes, and deer are sometimes seen travelling to and from the river. The campground area is an oasis in this dry environment, and as such it attracts many species of birds. Some of the most colorful that are often seen here during the summer months are the Western Tanager, Mountain Bluebird and the Northern Oriole. Canoeing and kayaking opportunities are available in the area. Both vessels can be easily launched from the park. Canoeists should check the grade of the river before attempting navigation. 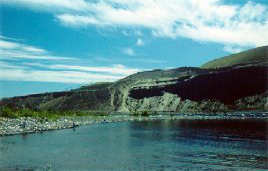 Thompson River contains trout, steelhead and salmon. Anyone fishing or angling in British Columbia must have an appropriate licence. There are a few undesignated trails used by visitors in the vicinity of the campground. Caution should be used when hiking in the area. Watch out for prickly pear cactus and during the months of March – June, watch for ticks. During lower water levels on the river, there is a small “swimming hole” on the beach in front of the campground. It is an area that is naturally sectioned off from the main river and provides a more protected swimming opportunity. Use caution as the waters of the Thompson River are dangerously swift especially during high water. There are no lifeguards on duty in provincial parks. There are bird watching opportunities at this park. There is a small boat launch area at the park that is suitable to launch smaller fishing boats. The boat launch is a rustic gravel access directly into the Thompson River. Environmental conditions can and will alter access and use of this site annually. Please be aware that this access is directly into the Thompson river, and all boats should be equipped with sufficient motor size to navigate upstream on this watercourse. No campfires are allowed in the day-use area. Ensure that barbecues or campstoves are used on the ground, not set on picnic tables. In addition to the water hook-ups at each site, there are potable water posts available near the pit toilets and in the grassy tenting area. There is a large day-use parking area from which visitors can access the river and a small sandy beach area. There are two day-use picnic tables. There are four pit toilets located throughout the park. There are hot pay showers at this park. This park offers vehicle accessible campsites, reservations are accepted, and first-come, first-served campsites are also available. Only one pit toilet is wheelchair-accessible. Roads and campsites are gravel.